Fantastic location in the desirable Gated Community of Fallingwater!! You can't beat this 1 Bedroom, 1 Bath Condo with an Oversize 1 Car Attached Garage. Features a Spacious Living Area, Bright Kitchen with Stainless Steel Appliances and ample Cabinetry, Separate Dining Space with access to the Covered Balcony, Large Master Bedroom with Attached Bathroom and Walk-In Closet. Access to Garage via a Finished Stairway with room for Coats, Boots, and Gear. Updates include Newer Laminate Wood Floors throughout main areas, Brand New Microwave, Brand New Kitchen Sink, Faucet, and Disposal, and New Tile Floors in Bathroom. Washer & Dryer are Included. HOA Amenities include a Community Clubhouse, Pool, Fitness Facility, and Outdoor Hot Tub!!! Water is billed quarterly by HOA, and is in addition to the monthly HOA fee. 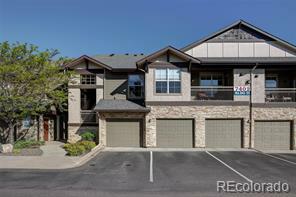 Conveniently located close to C470, the Foothills, Shopping, Dining, Parks, Trails, and Public Transit!